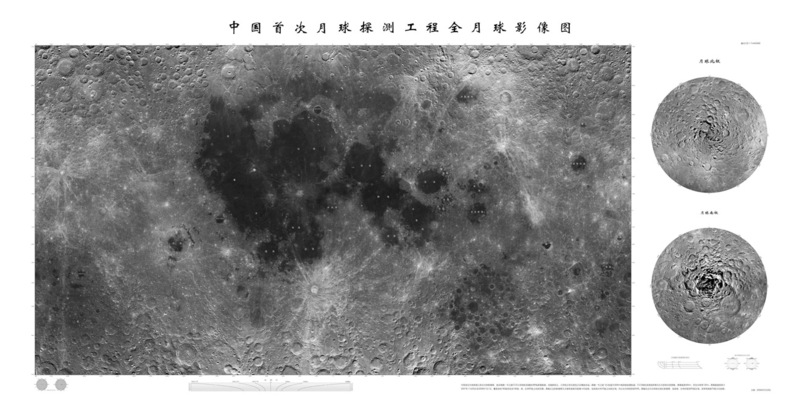 A higher resolution version of the Chang'e 1 photographic map of the Moon has appeared. And a different website has five previously unseen views, presumably closeups from the map mosaic. The new map - still not near the full 120 m resolution of the Terrain Camera - is a valuable addition to scientists investigating the Moon. Almost immediately I noticed some features I hadn't seen on the earlier Clementine image - the only other image map of the entire Moon. For example, the character of the Orientale Basin ring structure is very different on the east and west sides. On the east there is a broad, smooth area between the main Cordillera rim and the inner Rook rim, but those rings themselves are much harder to see on the west, and the space between them is rugged rather than smooth. Even more peculiar is the ~120 km wide and ~1200 km long band of lineations extending from the break in the SE rim of the Cordilleras to the area between Pingre and Phocylides. This is the thick, ropy swath of Orientale ejecta that includes the Bouvard Valley, but in this mosaic it looks more coherent and more unique than I've noticed it before. Another odd feature is the band of bright ejecta-coated mare material that extends from the center of the Zuuchius-Schiller Basin north past Schickard. A final feature that caught my eye is the meridional (N-S running) bright ray (the great long streak) passing through the darkish South Polar-Aitken Basin near the left edge of the mosaic. A fine new mosaic such as this will bring many features to our attention, and hopefully suggest explanations. I congratulate the Chang'e 1 team for this fine product and hope we will soon get to study the full resolution mosaic! The image above is a reduced version of the newly released map - see the bigger map to trace the features described in today's LPOD. This page was last modified on 18 August 2018, at 19:03.